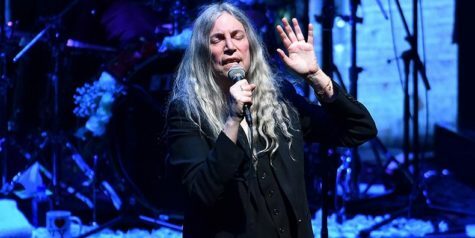 Pitchfork says: ‘At the Beacon Theatre in Manhattan on Monday night, Patti Smith opened for Patti Smith. After the Tribeca Film Festival premiere of Steven Sebring’s concert film Horses: Patti Smith and Her Band, the screen rose to reveal Smith and said band launching into her incantatory 1979 single “Dancing Barefoot.” Before her next song, a cover of Buffalo Springfield’s “For What It’s Worth” that stripped the protest anthem of its hippie hokeyness, she praised the teenage gun-control activists from Parkland and urged the crowd to keep fighting. Then some guy in the balcony started screaming, and she defused the situation by asking if he needed the bathroom, advising that when she had to pee but couldn’t find a toilet, she simply sought out the nearest tin can. Surprise appearances from Bruce Springsteen and Michael Stipe came later in the evening, like generous parting gifts, but it was during this early portion of the show that Smith achieved Peak Patti. Bruce & The Band At The Apollo: Wow!